I’ve been smearing this stuff all over pretty much everything this weekend. The growing list of food that has been slathered with roasted garlic butter at my house include: steak, chicken, asparagus, potatoes and just plain ‘ol bread. 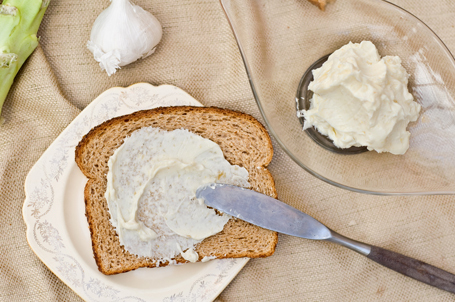 I have a wicked addiction to garlic, and now that it’s in spreadable form no food is safe in my house. Preheat the oven to 400. Cut the top off of your head of garlic and expose the cloves. Place it on a sheet of aluminum foil. Drizzle with the olive oil. 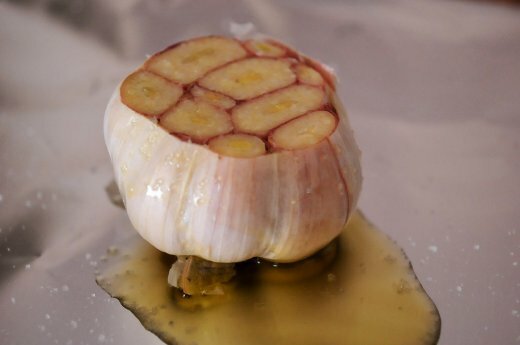 Fold the foil up tight around the garlic, place on a baking sheet and bake for 30 minutes or until soft. 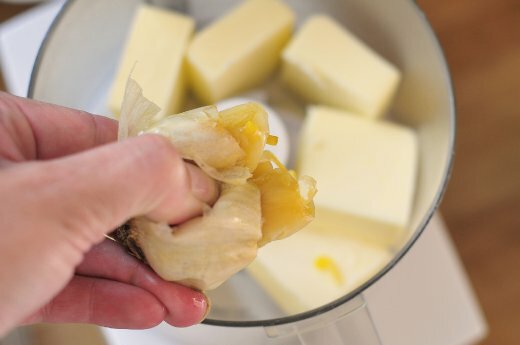 Place the stick of butter in a food processor. Squeeze the head of garlic into the food processors, pushing the softened cloves out of the head. 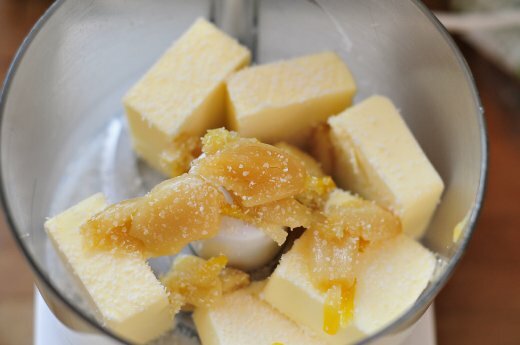 Be careful not to get any papery skin into the butter mixture. 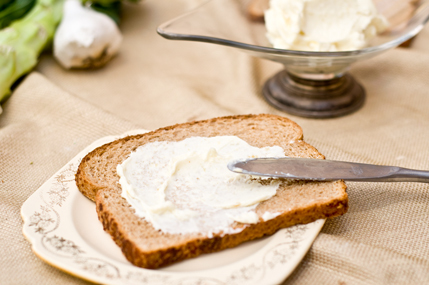 Garlic butter can be served softened, or chilled. 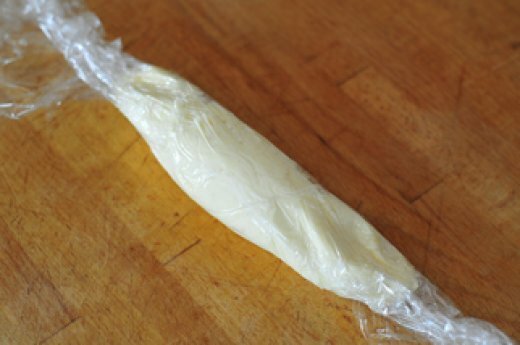 To chill the butter, place on a sheet of plastic wrap and roll into a log. Refrigerate until chilled and then cut slices and serve over warm meat, seafood and vegetables. I saw Bobby Flay do that once, but I still haven’t tried it yet. I don’t know why, because I have the same wicked addiction to garlic too. Drives my wife nuts! You know garlic is one of the staple ingredients in Indian cooking and I love cooking with it. However, there it wasn’t until I went to this restaurant specializing in garlic dishes that I realized there’s more to this ingredient than meets the eye. We had this amazing appetizer which was roasted garlic and I fell in love. It was so flavorful. I came across your recipe from Foodista and it is on my must try list. Thanks for posting. Here’s a tip when roasting one or more heads of garlic…try using a clean, inverted clay flower pot with a saucer, instead of wrapping it in aluminum foil. A small flower pot for one head , or a large one for up to four or five heads. Btw, I would probably make at least a pound of this, increasing the amount of roasted garlic proportionately, form it into a log, wrap it in parchment paper , chill it till firm, then vacuum-seal it and store it in the freezer.